Bowmore Distillery stands on the shore of Loch Indaal in the centre of the village of Bowmore. The focal point of the village is the junction at which Shore Street, running parallel with the shore of the loch meets Main Street, which runs from the harbour up to the Round Church at the top of the hill. Bowmore Distillery effectively occupies most of the land to the west of the junction and can be appreciated to good effect from the distillery entrance or from Bowmore's harbour. From here you can see written, in true Islay distillery style, the name "BOWMORE" in large black letters on the white painted walls of the bonded warehouse beside the shore. The distillery is at the heart of the village in more ways than one. Look along the street that climbs up on the inland side of the distillery and you can see at the top the village school, complete with a decorative distillery pagoda. Rather more subtle is the presence of the Mactaggart Leisure Centre next to the distillery. Not immediately obvious is that the leisure centre occupies what was once one of the distillery's bonded warehouses. Even less obvious is that the swimming pool in the leisure centre is warmed by what would otherwise be waste heat generated by the distillery operation. 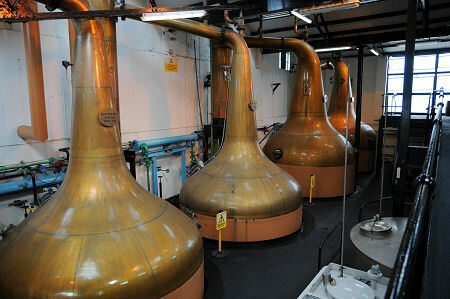 Bowmore produces what are by Islay standards fairly moderately peated whiskies. Its single malt whiskies are sold at a range of ages from 12 years old to 25 or more years old, while the very popular and highly rated Bowmore Legend has no age statement. Up to 30% of Bowmore's spirit is aged in sherry casks, and you are likely to encounter a number of other "expressions" resulting from storage in casks previous used for holding, for example, Port or Bordeaux. Visitors begin their tours of Bowmore Distillery in the visitor centre, which is located in the far corner of the courtyard you enter after passing through the distillery gates. Within the visitor centre is the reception area and distillery shop. Passing beyond this brings you to a nicely effective but low key presentation of the distillery's history. This is housed in part of the tasting room, which has full height windows offering superb views out over Loch Indaal. Bowmore Distillery has a particular fascination for visitors because it is one of only six distilleries remaining in Scotland (and three on Islay) which have their own traditional floor maltings, and which malt at least a proportion of their own barley on the premises. This is the way virtually all distilleries once did things, in the era before economies of scale meant that it became more attractive to buy in malted barley from large industrial maltings such as the one which dominates Port Ellen on Islay. At Bowmore this means that you can see the malt laid out on the three levels of malting floors. It also means that you can also see the peat fire beneath the kiln and perhaps the smoking floor within it. And if you happen to see the malt on the malt floors being turned, or moved by hand between stages in the process, you begin to appreciate what a hugely arduous and labour intensive process this is, and why traditional floor maltings virtually disappeared from Scottish distilleries in the 1960s and 1970s. But when you smell the utterly evocative aroma of peat smoke drifting from pagodas you understand how valuable a working floor malting can be to the ethos and image (and marketing and sales) of a Scotch whisky distillery in the 21st century. The highly regarded distillery tour then takes you through the stages in the process you will find in other distilleries. You can find out more about Making Malt Whisky from our series of feature pages showing the stages in the process. The mash tun at Bowmore is unusually attractive, and nearby you can see the two large copper vessels in which the water for the mash is heated. The six washbacks are of traditional Oregon pine and arranged in a single line. Each is named after one of the people who have owned the distillery during its history. The still room is also laid out in linear fashion, with two wash stills and two spirit stills. Accommodation is quite tight, and this presumably explains why only three of the condensers are within the room: the lyne arm of Spirit Still No2 projects out through a sloping roof to an external condenser. This oddity is mild by comparison with what the whisky writer Alfred Barnard found in the still room when he visited in 1886. At that time one of the stills had a spilt lyne arm that led to two separate condensing "worms" outside the building. Why this unique arrangement had come about was not recorded. After viewing the still room your tour moves on to a viewing area within one of the bonded warehouses before concluding back in the tasting room. Most sources tell you that Bowmore Distillery was founded in 1779, making it one of Scotland's oldest legal distilleries. In all probability it actually began distilling up to a decade earlier, soon after the laird, Daniel Campbell of Shawfield and Islay, began to develop what became the planned village of Bowmore in 1768. The distillery was established by David Simson, who had previously operated a distillery in what is now Bridgend. 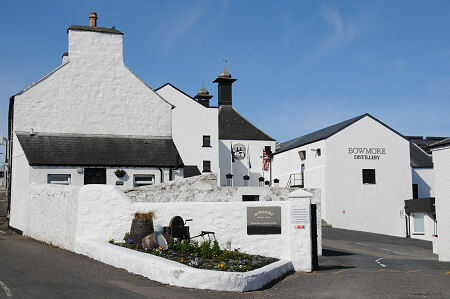 Bowmore Distillery was sold to W. & J. Mutter in 1825, and then to J.B. Sherriff in 1925. The distillery closed during World War Two, and was used as a base for RAF squadrons flying Short Sunderland marine patrol seaplanes from Loch Indaal. In 1963 the distillery became part of the predecessor of Morrison Bowmore, the company which still owns and operates it today. Bowmore, Isle of Islay, PA43 7JS.